Say What?! Yes, I am having identical twins!! I am almost 13 weeks and out of my 1st trimester! I can't tell you all how excited Trevor and I are to be parents to two little babies. 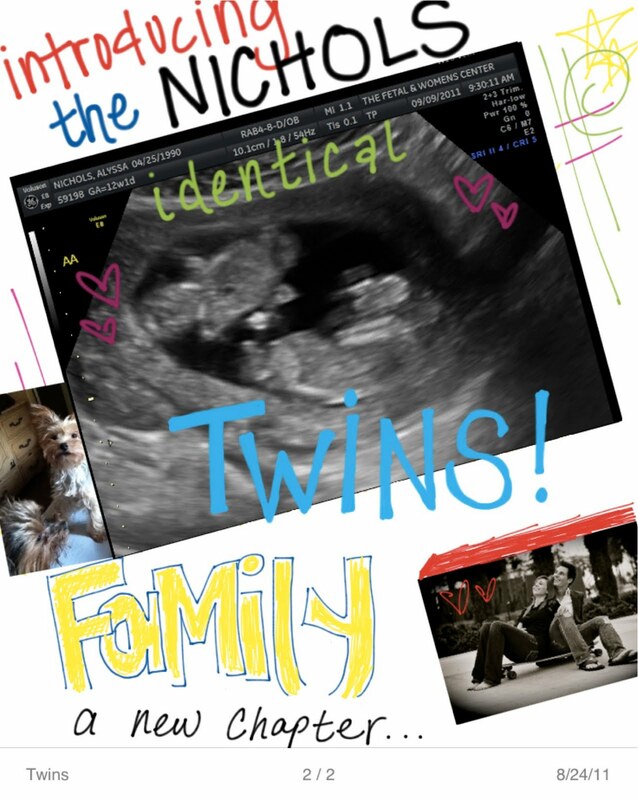 I mean we were already excited when we found out I was pregnant, but when we found out they were twins, it was like finding out I was pregnant all over again!! Back in July I had been waking up feeling super sick and I was always so tired. So I finally decided that I would take a pregnancy test. I woke up on 7/18/11 feeling really sick. I went to the bathroom and started to open the pregnancy test. It took me forever to get it open because I was seriously shaking so bad ha. I finally got it open and did my thing. I sat for those long 3 minutes and then looked at the test. Tears filled my eyes and I started to seriously freak out. I couldn't believe that I would be a mommy in 9 months to a beautiful baby that would be all ours for forever. Trevor had already left for the gym so I didn't have anyone to freak out with. I kept calling and calling and calling him but obviously the gym was way more important than my exciting news. ha Just kidding. I know this is a lame way of telling your husband that he is going to be a daddy, but there was no way I was waiting until he got home from work at 10:00 that night to tell him. I finally got a call and looked at my phone and saw that it was him. I answered the phone and I heard his voice on the other side. As I was holding back my screams, I said, "Hey babe guess what?" and he said, "What?" and I said, "YOU ARE GOING TO BE A DADDY!!" He started bursting out with excitement and couldn't believe it either! We were just so thrilled that we were going to be parents. I was about 5 weeks pregnant when I found out and was so eager just to be farther along already. We quickly told our parents, siblings, and close family at that time. We decided to not tell friends yet since we wanted the baby to be more developed and farther along. This was one of the best days of our lives! About a week later after my first doctor appointment, I asked Trevor for a blessing so that I would have comfort that the baby would be okay and so that it would develop healthy and be safe. Trevor laid his hands on head and started to give me the blessing. The words that Trevor said were amazing and we could just feel the spirit so strong. As the blessing progressed, Trevor kept pausing and instead of saying "baby", "babies" or "them" or "they" kept coming out of his mouth! He went on to say that the babies would develop healthy, that pregnancy and the babies would be ok, and that I would be healthy too. When the blessing was over, Trevor was just in shock and said it felt like words were being forced through his mouth. He would go to say "baby" and would be given the word, "babies" instead. I cannot tell you how much love I felt from my Heavenly Father at this time. I just love priesthood blessings. August 16th finally came around and it was time for our first ultrasound! This was an ultrasound for viability and I was already 8 weeks! 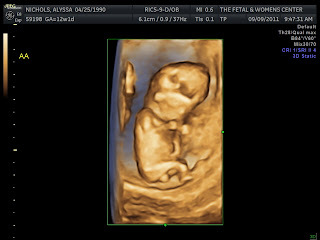 We were finally called back into the room and I got ready for them to do the ultrasound. The ultrasound tech starts her machine and starts doing her thing. My heart was racing and racing with anticipation to see my sweet little bud on the screen in front of me. 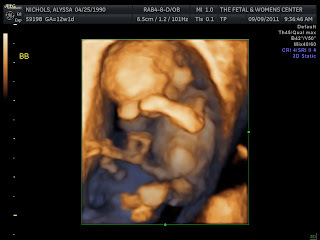 Let me add that my mom was in the room and is a registered nurse and she is able to read ultrasounds pretty well. As soon as the ultrasound tech scanned for baby, my mom let out a big "gasp" and then covered her mouth. I stared at her and was scared that something was wrong. The ultrasound tech then asks me if Trevor and I got pregnant on our own or if we did fertility treatments. We told her that it was all us and she just smiled. The tech then said, "hold onto your hats we have twins!" I just stared at her and couldn't believe the words that just came out of her mouth. I started crying and shaking with excitement and so did Trevor. I couldn't believe that we were going to be having twins! I have wanted to have twins ever since I was a little girl. It was my dream. I mean I guess we already knew that we were having twins because of the blessing Trevor gave us. Priesthood blessings are so amazing and at that moment in time, I was reassured again of Heavenly Father's love, that he is real, and that he has a plan for our little family. It is just flat out AMAZING. The doctor that works at the ultrasound place then came in and said that our twins were identical! She said that they both have two sperate sacks, but they share one placenta. She then said that the twins are mono chorionic twins which means that they are at risk for stealing blood and nutrients from each other. One could develop faster than the other and take all the nutrients and blood from the other twin. She said they look great already, but that it is something they will be watching throughout my whole pregnancy. It is a scary thing, but as soon as they see it, they can treat it right away. 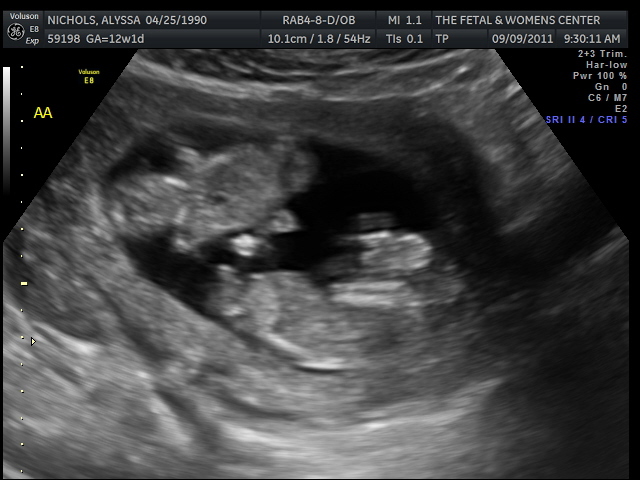 9/9/11 came and it was time for my second ultrasound! We couldn't wait to see the babies again. Hearing their heartbeats every time, makes my heart melt. The screen came up and we saw the babies! They were already so much bigger than the last time we saw them! They were so adorable. They were bouncing and jumping around everywhere. It was so funny to see them playing bumper cars with each other. It was the cutest thing ever. They already love each other so much! I just love it. The tech tried to tell us the gender but the babies were being stubborn. Their legs were crossed and when they moved their legs a little she said that she couldn't tell yet because it was a little too early. She could almost figure out what they were but she kept going back and forth with the genders. Hopefully next time we can find out!! The babies are both growing healthy and strong and are progressing great! We just love these little babies so much already. I honestly cannot wait to be a mommy and Trevor cannot wait to be daddy to not just one baby, but two. Being a mommy has been my dream ever since I started playing with baby dolls when I was little. I can't believe that my time is coming to fulfill my dream. I seriously cannot wait. We know that it will be hard raising two babies, but we know we will be blessed. We have such loving family and friends that love us and will help us. We love you and thank you all for your support and prayers in our behalf! We cannot wait to be parents to these cute babies and start the next chapter of ours lives. this made me so happy to read. i just love this so much! i am thrilled for you two! congratulations alyssa :) what an exciting time! what would we do without this gospel?!! good luck to you both! You had me crying right along with you. I am so glad you are both happy to be parents. I am sure you will be fantastic!! Alyssa, I am so excited for you both! I loved your words you shared. The priesthood is so amazing and you are lucky to have a husband who is worthy of it! I seriously know that excitement of seeing your baby(ies) haha! I hope your pregnancy goes wonderfully. You're so cute, I'm sure you look so cute prego!! I love it! Made me tear up with excitement for you. Being a mom is so much fun (with its own trials but so worth it!) I can't wait to find out what you are having...and how awesome it was to have Trevor filled with the Spirit so much that only what was suppose to be said was said. New follower! I absolutely love this post! So incredibly sweet! Congrats on the twins! Can't wait to get to know you and follow your pregnancy! I just stumbled upon your blog from Alexis Laughs and your blog is so cute!! !